What's the Difference Between an Asteroid and a Meteor? Today, we dealt with an asteroid and a meteor. 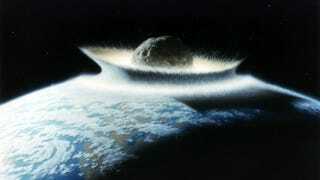 The 2012 DA14 asteroid zipped passed Earth today and a meteor exploded over Russia. What the heck is the difference between an asteroid and a meteor? And a meteorite? And a meteoroid? Not too much, apparently! An asteroid is a rocky object in space that's not as big as a planet and isn't a moon. There are millions of them, think the asteroid belt in space. A meteor is an asteroid that burns up as it enters the Earth's atmosphere, think shooting stars. A meteorite is a meteor that actually lands on the surface of Earth, think about Russia today.